The Big Bang was not an explosion of matter into space like a bomb. Instead, space itself expanded, allowing the matter in it to cool and condense from a hot plasma into the stars and galaxies we see today. The matter in the universe is not flying away from the center of some explosion. The matter is just sitting there, and the space it is sitting in is expanding. Space, as far as we know, is infinite. And as far as we know, it was infinite at the time of the Big Bang. All of the matter in the universe was packed so densely that the bits that make up the farthest galaxies we can see were all within a few inches of each other a fraction of a second after the Big Bang. But there was matter packed that densely infinitely in all directions. We can’t see all that other matter, because the light from it hasn’t reached us yet. When someone says that the universe was the size of a baseball at some moment in time, they mean that all the matter we can see was crowded into that size. Space was still infinite, and filled with an infinite amount of matter. When we look deep into space, we see galaxies that formed billions of years ago. They are billions of light years away from us. An observer in one of those galaxies could look in the same direction we are looking, and see galaxies that we cannot see, even more billions of light years away. All of infinite space is filled with galaxies. We can only see those within 46 billion light years from us because the light from galaxies farther away has not had time to reach us yet. Space continues to expand. Those faraway galaxies keep getting farther away. But they are not moving through space away from us. Space itself is expanding, so there is more space between us and the faraway galaxies. Because space itself is expanding, the distance between you and some distant galaxy is getting larger at a speed that exceeds the speed of light. Matter cannot move though space at the speed of light, let alone faster than the speed of light. But because space itself is expanding, the farther away something is from us, the faster it recedes from us. At some distance, that recession speed is equal to the speed of light. Beyond that distance, the recession speed is greater than the speed of light. And infinitely far away, there are galaxies receding at an infinite speed. But they are not moving through space at that speed. As the light from distant galaxies travels towards us, the space it travels through is continually expanding. This causes the light waves to gradually stretch. Longer waves are said to be “redder” than shorter waves, because red light has a longer wavelength than blue light. Galaxies very far away are redshifted so much that the light is no longer in the visible portion of the spectrum. But it isn’t just light that gets stretched. All events are stretched. If a star expands and contracts on, say, a weekly basis, nearby observers will see the light from that star get brighter and dimmer every week. But an observer farther away will see the time between bright and dim phases take longer. At some distance they will see the star vary every two weeks. Farther out, it may take a month. This is because the space between the observer and the star has expanded, and the distance between the bright periods grows. Some people refer to the redshift associated with the expansion of space as a Doppler shift. This is incorrect. A Doppler shift is what happens when a periodic signal is emitted from a source that is moving through space relative to the observer. Suppose a train was blowing its whistle as it receded from you. You would hear the sound get lower in pitch if it accelerated away from you. But if it receded at a constant velocity, the sound would keep the same pitch. If the train then stopped moving, the sound would rise back up to its original pitch. The redshift that occurs because space is expanding does not work that way. Because the distance between peaks in the wave is getting larger as time goes by, the light gets redder as time goes by, no matter how the source of the light has moved through space in the meantime. The difference between a Doppler red shift and the red shift due to expanding space is easiest to see when the distances are greatest. A Doppler shift of the light from a galaxy moving away from us at the speed of light would be infinite. The peaks of the wave would be an infinite distance apart. But we see galaxies receding from us at the speed of light, and the light from them is stretched by only one and a half times. We say that a galaxy with a redshift of 1.5 is receding at the speed of light. 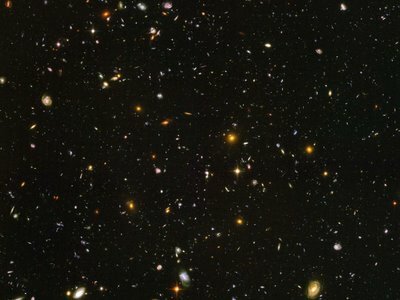 We can currently see about a thousand galaxies that have redshifts larger than 1.5, which are receding from us at speeds greater than the speed of light. The cosmic microwave background, the light from the hot plasma of the early universe, has been stretched about a thousand-fold in the 13.6 billion years it has taken to reach us. The location in space where that light originated is receding from us at 50 times the speed of light. 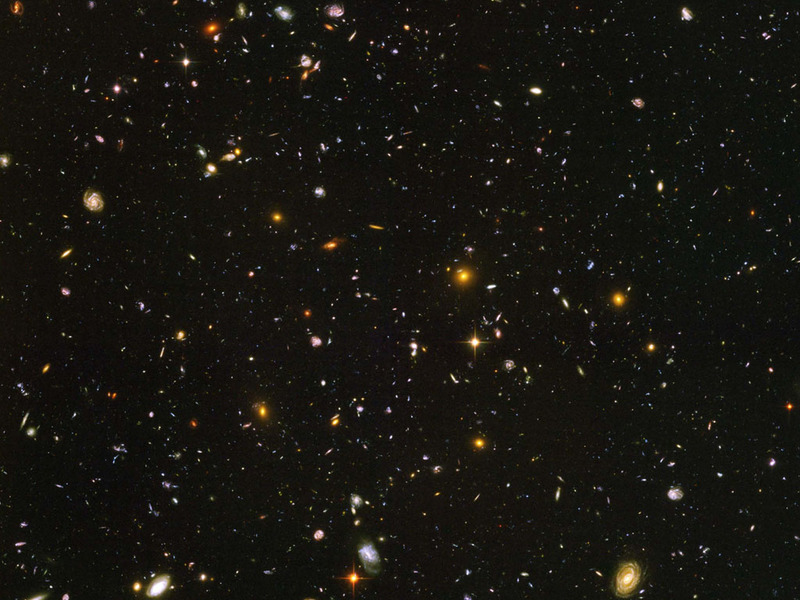 The most distant objects we can see in the universe are about 46 billion light years away. The universe is only 13.6 billion years old, but because space has been expanding for that long, the distance between us and something that emitted light 13.6 billion years ago is about three times as far away as it would have been had space not been expanding. The speed of the expansion of space is constant. This means that objects that are bound together by forces such as gravity or electromagnetic forces will stay the same size as space expands. If the expansion of space were accelerating, this would not be the case, and eventually all particles in the universe would drift apart in what has been called a “big rip”. But recent observations have shown that the rate of expansion is not increasing.